A young boy sits at the entrance way to a village hut, with large gourd containers nearby, along with an oil lamp and a tin bowl. The thatched entrance way is supported by a loosely arranged stake wall that allows light and air into a sort of extended frontal porch, with the entrance into the main hut just visible at the back. Note on print reverse ms pencil - "4 101 "
Morton, Chris. 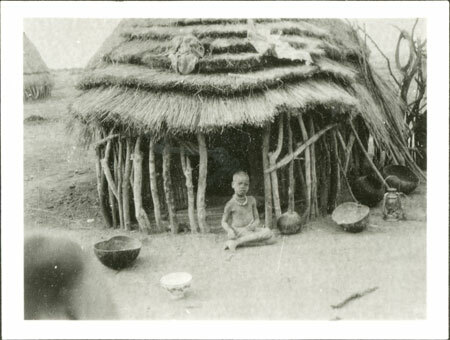 "Nuer hut" Southern Sudan Project (in development). 03 Jan. 2006. Pitt Rivers Museum. <http://southernsudan.prm.ox.ac.uk/details/1998.346.101.2/>.